The Danube Delta is the place where the Danube River flows into the Black Sea and create a maze of water canals, vegetation and a paradise of birds and fishes. The scenery is completed by charming old fishermen villages. 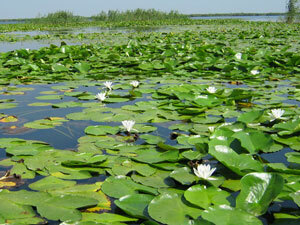 Danube Delta is a very popular place for the lovers of nature and bird-watching tours. 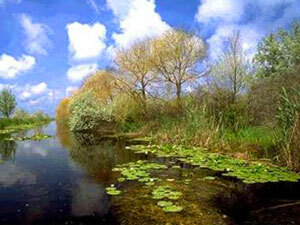 It is also included in the UNESCO Natural World Heritages and it is considered the last wild territory of Europe. The DDBR flora is represented by 2 383 taxons, and 70% of the vegetation is dominated by reed (Phragmitesaustralis), sedge(Typhaangustifolia), associations of Scirpetum and reed vegetations on floating formations. On lakes and channels there are aquatic plants represented by underwater species: water lilly (Nymphea sp., Nuphar), Trapanatans, Potamogeton sp., Myriophyllum sp., Utricularia sp. In Letea and Caraorman Forests, developed on lower and humid areas between sand dunes (areas called “hasmace”) grow species of oak (Quercusrobur, Quercuspedunculiflora) along with ashtree(Fraxinusangustifolia, Fraxinuspallisiae) and different species of shrub and climbing plants: wild vine (Vitissilvestris) or lianas (Periplocagraeca). The sand dunes typically hold arenaceas associations (Koeleriapyramidata, Koeleriaglauca, Festucapallens etc.). On areas with salted soils frequently grow halophile plants associations of Salicornia herbacea, Suaedamaritima, Puccicineliadistans, Aeluropuslittoralis and Limoniumgmelini. A distinct category is represented by rootless plants (floating plants) like Salvinianatans, three species of Lemna, Wolffiaarrhiza, Utricularia vulgaris, and Spirodelapolyrrhiza. During the inventory of the species from the DDBR two completely new species were discovered: Centaureapontica and Elymuspycnattumdeltaicus. Due to very favorable conditions created by the big variety of terrestrial and aquatic habitats, as well as the proximity of some palearctic fauna regions (mediterranean, eurasian, Black Sea), the fauna from the DDBR is represented by 4.029 species, from which 3 477 invertebrates and 522 vertebrates. The invertebrates represent from far the most important part of the DDBR fauna, with more than 3 477 species. There are 73 species of worms, 91 species of mollusks, 115 crustaceans, 168 spiders and 2 244 other species of insects. 37 new species were described, including 1 worm Proleptobchusdeltaicus, 5 species of spiders, 1 fish Knipowitschiacameliae and 30 species of insects (Isophyadobrogensis, Diaulinopsisdeltaicus, Homoporusdeltaicusetc). Approximately a third of these species were and still are subject to commercial fishing, including the sturgeons (since 2006 there is a 10 year prohibition) and the Danube mackerel (Alosapontica). The amphibians and the reptiles are also well represented in the DDBR, most of the species being under legal protection. There are 10 species of amphibians: marsh frog (Rana ridibunda), fire-bellied toad (Bombinabombina), European tree frog (Hylaarborea), common spadefoot (Pelobatesfuscus), common toad (Bufobufo), European green toad (Bufoviridis), Syrian spadefoot (Pelobatessyriacusbalcanicus), Rana lessone and two species of water lizard, Danube crested newt (Triturusdobrogicus, Triturus vulgaris). The reptiles are represented by 12 species including testaceous, lezards (Sauria) and snakes (Serpentes). 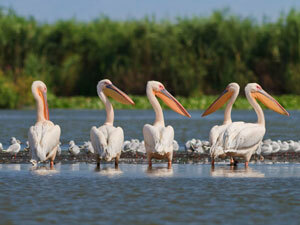 The Danube Delta Biosphere Reserve remains famous for its birds, with a total of 331 species (apart from the 520 species inventoried in Western Europe). 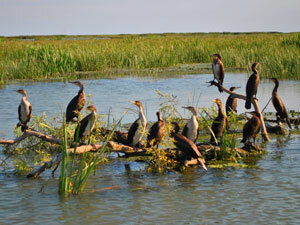 The area is worldwide recognized as nesting place for many bird populations like the white pelican (Pelecanusonocrotalus), the Dalmatian pelican (Pelecanuscrispus) and the pygmy cormorant (Phalacrocoraxpygmeus). The Bern Convention protects an important number of birds (313 out of the 331 species), mammals (22 protected species and 7 strictly protected species) and fish (22 protected species). In the springtime the mountain meadows of Romania are a riot of wild flowers, 12 % percent of which are endemic to the Carpathians. From April to July you can find spectacular scenes of clover, hawk weed, burdock, fritillary, and ox-eye daisy covered in butterflies and on higher levels you can see gentians, white false hellebore, bulb flowers and crocus. Alpine plants also include campanulas, saxifrage, orchids, alpine buttercup, pinks and in a few places eidelweiss.